The fallacies surrounding many ideas in perpetual motion are set forth in this interesting yarn which recounts some of the impossibilities suggested to solve the age old problem of getting power from nothing. Wheels with over-balance, sponge engines, gold leaf machines, and a railroad which appears as though it might actually work are recounted. OF ALL the mechanical brain-bugs that repeatedly surge over the country, the perpetual motion bug holds all records for depth and duration of sting. The perpetual motion idea has been recurring in cycles and minor cycles for over a thousand years, or since the birth of scientific thought, and magazine editors have recently noted that the virus has again affected inventors. Thus it is we have at present a wave of all manner of hare-brained schemes for extracting power from nothing. 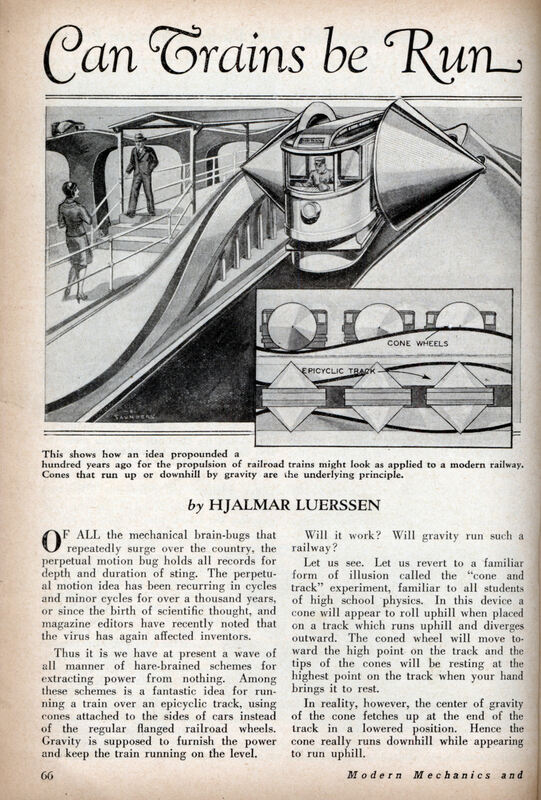 Among these schemes is a fantastic idea for running a train over an epicyclic track, using cones attached to the sides of cars instead of the regular flanged railroad wheels. Gravity is supposed to furnish the power and keep the train running on the level. Will it work? Will gravity run such a railway? Let us see. Let us revert to a familiar form of illusion called the “cone and track” experiment, familiar to all students of high school physics. In this device a cone will appear to roll uphill when placed on a track which runs uphill and diverges outward. The coned wheel will move toward the high point on the track and the tips of the cones will be resting at the highest point on the track when your hand brings it to rest. In reality, however, the center of gravity of the cone fetches up at the end of the track in a lowered position. Hence the cone really runs downhill while appearing to run uphill. And looking into the annals of perpetual motion history, we see that over a hundred years ago one Jaime de Bonheur proposed the building of such a railroad. Not lacking in ambition, he. His idea encompassed and envisioned a railroad of this order built around the world! The subject of this idea has been treated very cleverly* by Stewart Rouse, nationally prominent cover artist, in this month’s Modern Mechanics. Of course, for reasons just mentioned, it will not work unless the whole path of the train was continually downhill. It would not run on the level any farther than from the bottom to the top of one of the track humps. This subject is a fascinating one. Plenty of men have gone crazy trying to solve the riddle of perpetual motion. Plenty more will go dotty as time goes on â€” that’s a sure-fire bet. Even the artist, Leonardo da Vinci, the greatest mind of his time, could not withstand the temptation to present to the world a perpetual motion scheme. He designed a wheel on the oft invoked principle of over-balance but soon came to the conclusion that he was pursuing a phantom. The idea of permanent over-balance, as an endless source of power as contradicting as it appears returns constantly as a principle of eternal motion. During the year 1640, the Marquis of Worcester announced the production of a wheel, which was to be kept in constant motion through swinging weights. The test took place in the presence of King Charles I and his entire court in the Tower of London. Nothing is recorded regarding the success of the demonstration, at any rate the invention has sunk into oblivion which in itself would indicate that the wheel of the Marquis of Worcester did not run eternally. In former times, patent offices were not quite as rigorous. In England alone, more than 600 patent rights were granted on perpetual motion machinery. The first one of these patents was published on March 9th, 1635, and concerned of the many wheels with permanent “over-balance”. In 1770 already the philosopher, Sir James Ferguson, tried to convince the world of the impossibility of perpetual motion. He, too, built a machine with swinging levers and shifting weights, which was to prove the impossibility of the principle of permanent over-balance. But in spite of that people kept on inventing. When the first bicycles with chain transmission were put on the market, the idea to gain something from the nothing received a new impetus. One inventor conceived the exceedingly simple idea that an endless chain hanging loosely over the crown of a wheel would create an overbalance. Even Leonardo da Vinci, the greatest technician of his time, could not withstand the temptation to present to the world a “perpetual motion.” He designed a wheel on the same principle of over balance, but was to rest principally on one side of the wheel only and a secondary roller or wheel was to guide the chain in such a way, that it would always run onto this one side, of the large wheel only. With a real heavy chain, the inventor hoped to be able to set a dynamo into motion. But the chain remained inmovable, for the two parts could not be brought out of balance. The absurdity of a permanent over balance becomes evident at once, if one considers that it takes the same amount of power to lift a weight as is gained by lowering same. Not only can nothing be gained in that way, but the loss of power resulting by friction, will inevitably bring the machinery to a stop after it has been set in motion. About twenty years ago, a wheel was on exhibition in a show window in Berlin, which was turning for hours and which was considered by naive onlookers as the long hailed “Perpetuum Mobile.” If the onlookers had been more patient and had stayed long enough, they might have seen a man appear in the show window about every half hour, to set the wheel in motion again. You might be interested in the fact I have studied perpetual motion machine concepts since many years. You will find the results of my research work at hp-gramatke.net. To me, the “modern mechanix” was completely new, although there was a publication in a German magazine “Wissen und Fortschritt” i.e. 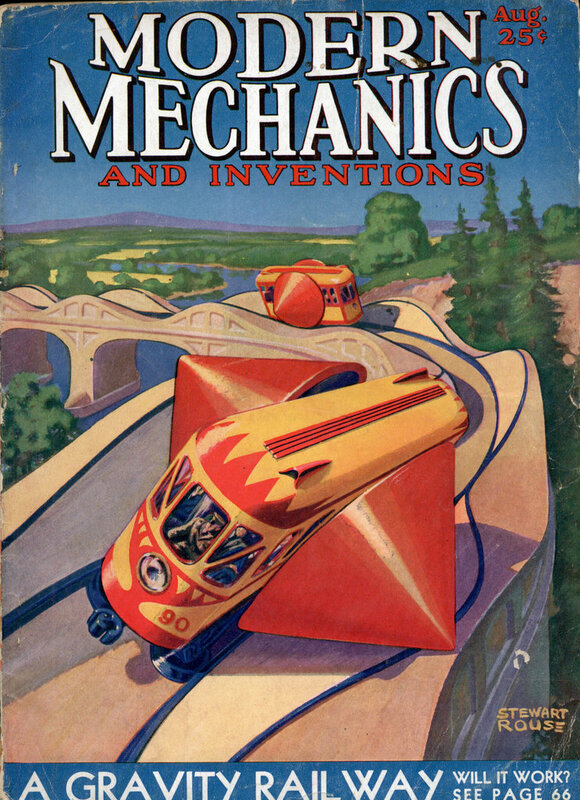 “Knowledge and Progress” shortly after this article, which not only uses image material from the cited text, but also from an article in Hugo Gernsback’s magazine “Science and Invention”. Wasn’t there a german language “Perpetual Motion Journal”? Were you involved in its publication? i think that i have a very powerful and working gravity wheel not only rotate at perpetual motion but also generate energy as the same power as water wheel or wind turbine , without any body or extra power to set it in motion again.